Jean-Charles Haas from SAMSE, a distributor of building materials and equipment, recently sent a letter of thanks addressed to Matteo Baratto, expressing his satisfaction with Eureka’s Picobello. I came across your email address whilst looking for some details regarding your Picobello 151 Sweeper. I’ve been meaning to thank you, which during your visit I didn’t do at the time, and to inform you that I have already put in place a dozen sweepers in my branches. 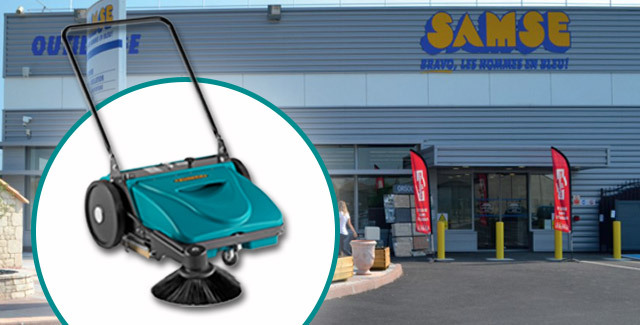 The SAMSE Group provides a wide range of products to the construction industry, with a distribution network in France made up of over 340 shops. Mr. Haas purchased the first Picobello back in 2010. His feedback, after all these years, is a testament to the quality and long life span of Eureka’s manual vacuum sweeper. Discover more about the Picobello 151 here.